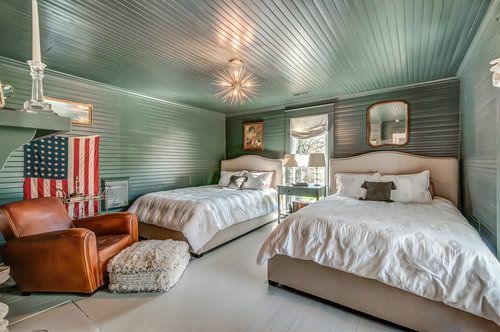 House + Sanctuary is a vacation rental collective owned by Sarah McConnell, a California native who fell in love with the history and southern hospitality of Tennessee. 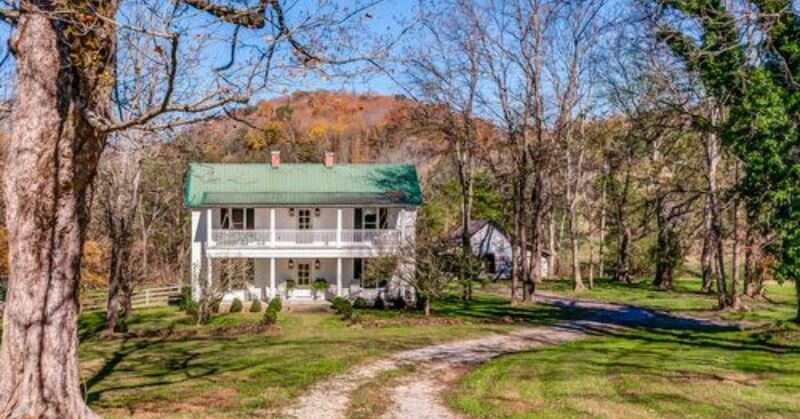 Fox Country Farmhouse is an 1860s charmer tucked in Cornersville, Tennessee, just one hour south of Nashville and 45 minutes from downtown Franklin. 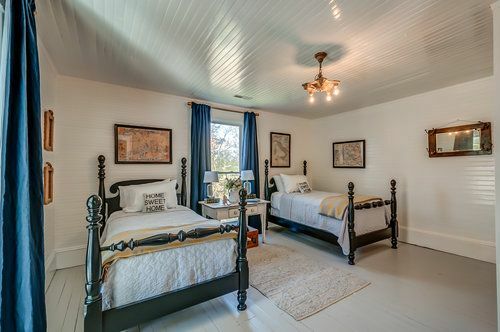 The home is decorated with vintage farmhouse flair throughout and described by visitors as "straight out of a magazine." 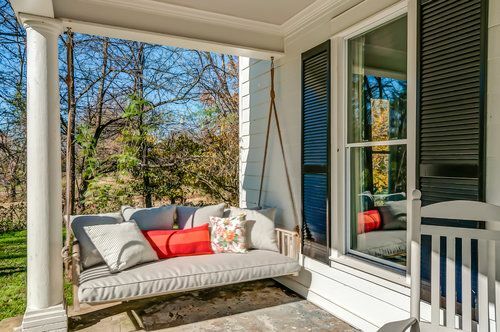 Of course, no Southern home is complete without a front porch swing. White exterior paint and black shutters complete the farmhouse profile. Floral wallpaper welcomes guests in the entryway, which is finished with vintage collectibles and a gallery wall of antique mirrors. 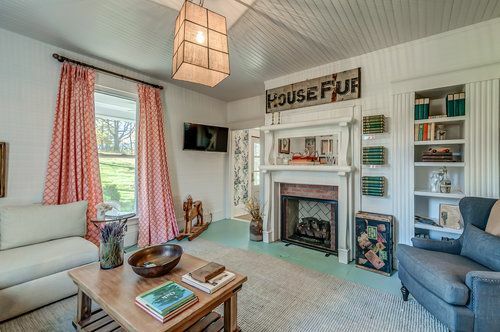 In the living room, hardwood floors and ceilings wear mint green and white paint, respectively. A wood fireplace is positioned next to a built-in bookcase, outfitted with books and collectibles. The sisal rug anchors the sitting area under a canvas pendant light. 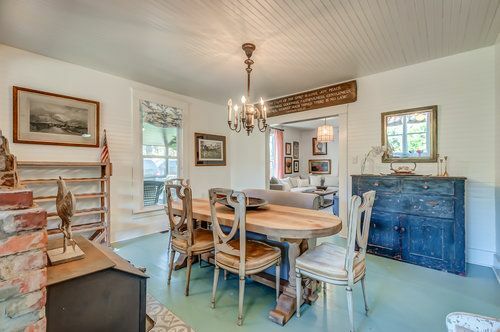 Between the kitchen and living area, the roomy dining space features an antique French dining table and chairs to seat six. Impressive vaulted ceilings, highlighted by contrasting black paint, offer space for large bay windows over the sink in the kitchen. A roomy island doubles as a breakfast bar with counter-height chairs. 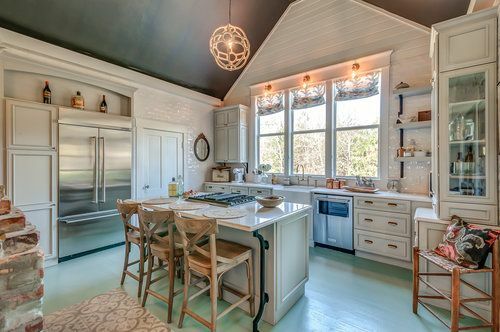 Cooking here is a dream, as the space is outfitted with KitchenAid appliances, a gas stove and farm sink with brass faucet. 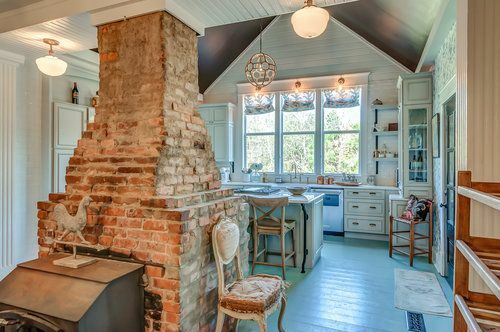 Off of the kitchen, the original wood stove reminds guests of the home's historic factor. 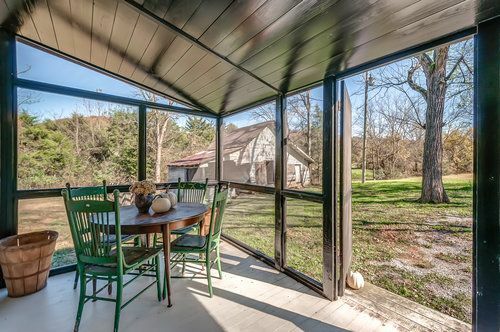 In the back, a screened-in porch offers another beautiful seating area overlooking the grounds. Beyond, there is an outdoor fire pit. With three bedrooms and a pull-out sofa, the home can comfortably sleep 10. Two twin beds in this guest room feature Sleep Number mattresses and luxury linens. Vintage maps decorate the space. 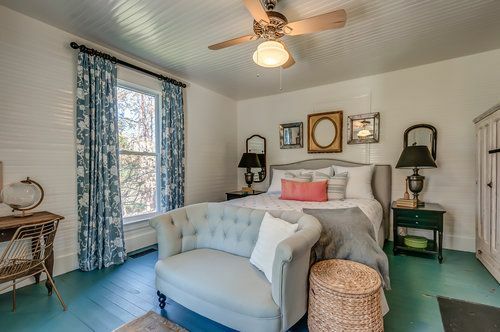 Shiplap siding painted a minty green creates a vintage shell in the guest room, which features two double beds and a comfy leather armchair. A starburst chandelier adds a contemporary touch to the antique styling. The downstairs master bedroom features a king mattress and chic settee at the foot of the bed. A vintage desk offers an additional working space. 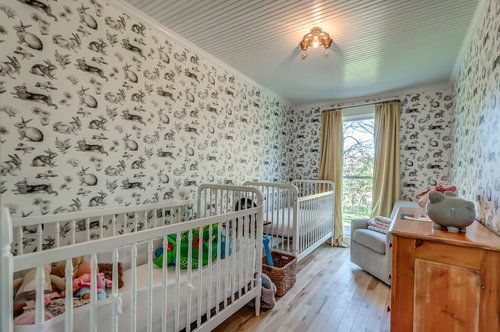 The nursery, complete with twin cribs, is outfitted in a vintage rabbit wallpaper. 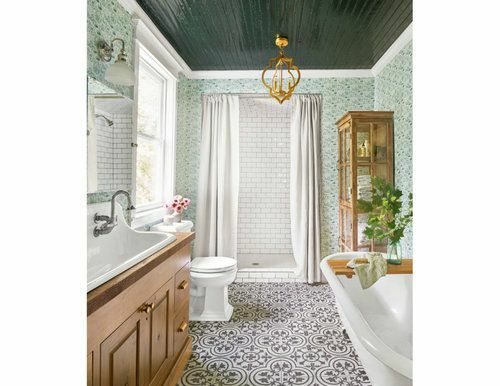 The luxurious bathroom showcases an antique claw foot tub as well as a walk-in shower. 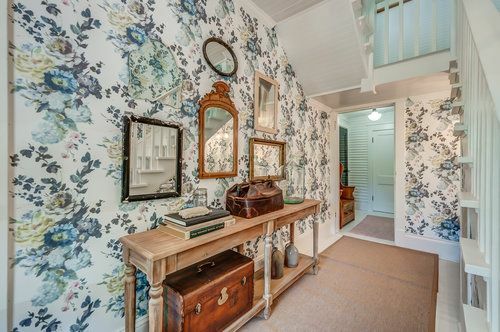 The vintage vanity and green floral wallpaper complements ceramic tile underfoot.